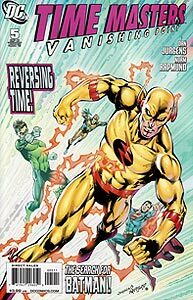 Cover Description: Green Lantern, Booster Gold, and Superman pursue Professor Zoom. Brief Synopsis: The Time Masters search for Bruce Wayne is sidetracked by a need to ensure the dawn of the Atomic Age. Issue Notes: Tie-in to Batman: The Return of Bruce Wayne. As seen at the conclusion to the previous issue, Booster Gold, Claw, Green Lantern, Rip Hunter, Skeets, Starfire, and Superman are trapped in a time vortex generated inside the castle of the wizard Serhattu. Booster is only a spectator as Green Lantern finally proves his worth against the trap. I haven't visited as many "bases" as Hal Jordon, but most people who have lived in the nuclear era should probably be able to recognize the tower structure commonly used by the United States for above-ground nuclear tests in the 1940s and 50s. The world's first atomic bomb was detonated on the White Sands Proving Ground in central New Mexico. The bomb was the culmination of the Manhattan Project, a top-secret United States operation to develop an atomic bomb before the Axis powers. The name of the test site, "Trinity," was suggested by J. Robert Oppenheimer, scientific director of the Project. 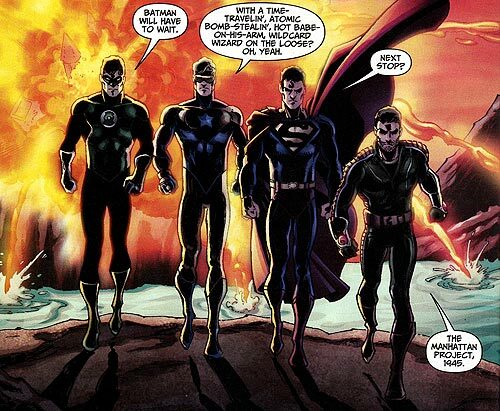 Even comic book characters want to look cool while walking way from an explosion. But, um, say, has anybody seen Skeets lately? Like, say, since the Time Masters escaped from the deadly time vortex? Whew. There he is. Skeets has made the journey with the others to White Sands, New Mexico, on July 16, 1945. If local time is 5:17:12 AM, the first atomic bomb will be detonated in 12 minutes and 33 seconds. The base camp for the scientists supervising the bomb's detonation was 10 miles south of the Trinity site. Three manned bunkers were built within 10,000 yards of the Trinity site. Oppenheimer directed the bomb detonation from one of these bunkers. A radio operator notes that there are 30 seconds until detonation. POWER DOWN: It is unclear how much time had passed between the Time Master's arrival in 1945 (as seen on page 11) and their trip to base camp (as seen on page 16), but it is certain that less than 12 minutes were remaining before detonation when the Time Masters left base camp for the Trinity site on the previous page. If events in the previous panel took place while the Time Masters were still at base camp, Superman would have flown 10 miles in under 30 seconds, better than twice the speed of sound, to reach Serhattu and Skyle before detonation. While this may be well within the demonstrated capabilities of Superman (or Green Lantern in space), Booster Gold has never been able to fly faster than the speed of sound in any environment or time period. Boosterrific Review: A better issue than the last, this comic is chock full of activity and revelations even as it struggles to address its tenuous connection to Batman: the Return of Bruce Wayne. The events of this issue are told in a style similar to that used by Jurgens during his tenure writing Superman stories 20 years ago. Several subplots, happening nearly simultaneously (if that is the right word for time travel stories), dovetail fluidly, increasing the tension and allowing each story to develop at its own pace. The Timer Masters' trip to the dawn of the Atomic Age may seem like a sidetrack even for a mini-series about sidetracks, but the one-and-done nature of the trip is refreshing after several issues of prolonged swords-and-sorcery tales. Still, it is the story of the Black Beetle's adventures that are the most intriguing in this series, and the hope his story this will one day play a larger role in the adventures of Booster Gold and the DC Universe is more than enough reason to keep reading. Continued enjoyment of this series. Now that I appreciate it as a precursor to Flashpoint, even my lingering complaints about it not be connected to the search for Batman are gone. There's a little art mistake in the splash page, (when all the heroes are in the vortex), in the costume of Starfire, her left leg should not be visible, her costume cover that leg. I love this series if for no other reason than the revelations of old-Booster's relationship to young-Rip, and I can't help thinking that this should be the storyline playing out in Booster Gold, hell the time traveling team of time masters might help boost sales of Booster Gold. and in the end, isn't a self sustaining Booster-centric book the goal? Jurgens has some interesting plots brewing with Rips' past, who the current Supernova is (the hints might answer a question raised above) and what Black Beetle is trying to do. I am a little confused with it saying Waverider was killed when the 52 was created given his death in the max-series. My favorite Booster read of the month.